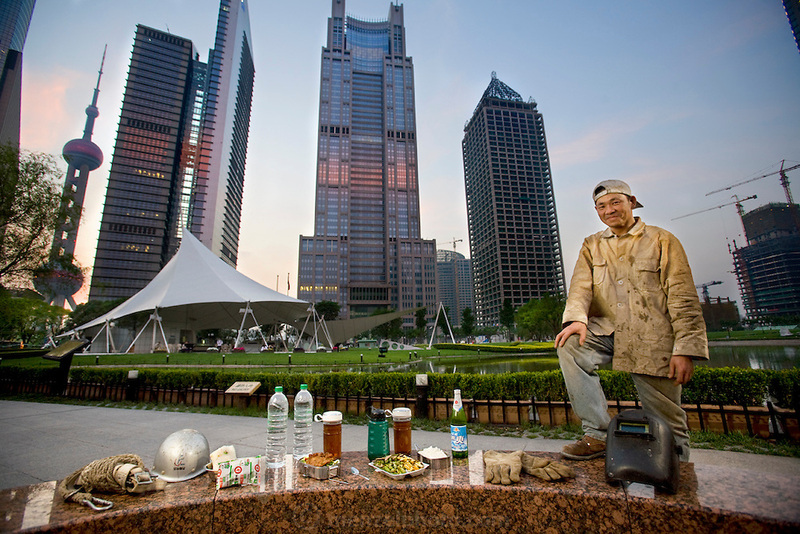 Construction welder Huang Neng, with his typical day's worth of food in Pudong's Lujiazui Central Green Park in Shanghai, China. (From the book What I Eat: Around the World in 80 Diets.) The caloric value of his day's worth of food on a typical day in June was 4300 kcals. He is 36 years of age; 5 feet, 6 inches tall and 136 pounds. The migrant welder has worked on a dozen trophy skyscrapers on the Huangpu River in Pudong New Area, across the river from old Shanghai. His current project is the Zhongrong Jasper Tower, at far right, which will top out at 48 floors?a short-statured building compared to its neighbors. MODEL RELEASED.